This final Christmas gift of 2016 (that I'm blogging about - there are more to come in the future) was actually finished in 2017 - whoops! This one also has something of a back story, so read on! 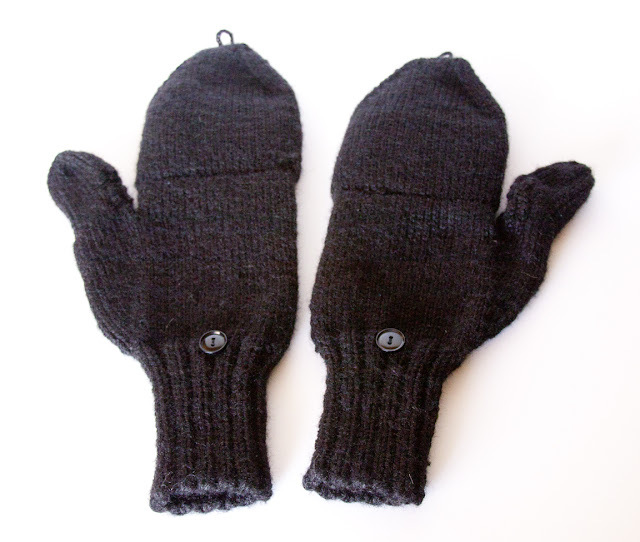 Years ago (like literally multiple years) my husband really wanted a pair of gloves with cut off fingers but also with a move-able flap. He was working as a police officer at the time and was always having to take off his gloves in the cold to write paperwork, so I started looking for patterns. I discovered the free Chilly Podsters just in time for it to get warm that year, so I just kept the pattern in my queue and forgot about it. Fast forward to Christmas of 2015. Everything was falling apart between my husband and I, but we still were exchanging gifts. We didn't end up celebrating together until over a week later, but I just hadn't felt motivated to make anything for him if I'm perfectly honest. I was so frantic making things for all our other family members that I put his aside and just wrapped up a copy of this pattern with the yarn I was going to use and gave him that with the promise to make them soon. Shortly after that we split up, so I certainly wasn't going to spend my time making him anything. It's been a whirlwind few years, which I may explain one day, but things are looking a bit better lately and we have been "hanging out" (lol that sounds so lame, but I can't think of what else to call it). So when I started brainstorming for what to give him for Christmas, I thought it might be poignant to finally make him these gloves. Little did I know how involved of a project these would be, so I only had one glove finished to give him for Christmas, and I finished the second one on New Year's Day. Ah well. At least he has them now, right? About 4 years later, lol. So onto the pattern! Like I said, this is the Chilly Podsters pattern, which is free on Ravelry (follow the link). IT's really neat how you make these. 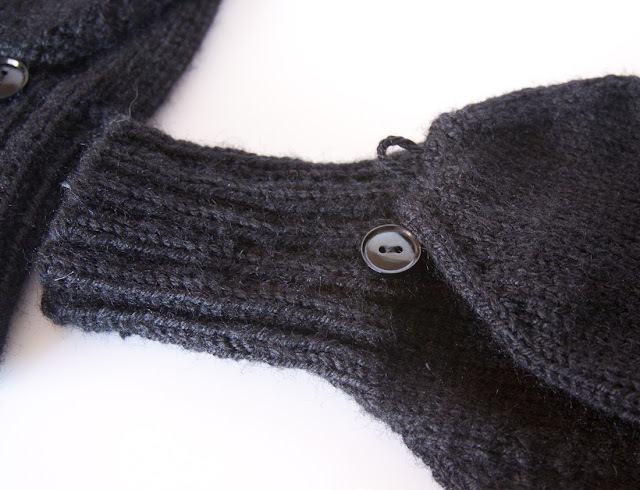 You knit the ribbing first, then separate and make each finger, then go back and make the mitten top. I made this in a black acrylic yarn because 1) my husband loves everything in black and 2) he can wash them and I won't worry they are ruined. I picked this yarn up at a thrift store a while back, so I'm not sure what it actually is, but it worked great for this project. It's a hardy yarn, so not a lot of pilling going on, yet not so rough they itch or anything. Overall I found them very comfy. I totally love the thumb! The gloves are really mindful of what people need nowadays, I think. Not only can you remove the cover on your fingers, but also on your thumb. This is part of what took longer in making them, but it was definitely worth the extra effort in my opinion. Now he can use his phone without removing the mittens. They are a bit big on my hand, lol, but they fit my husband just right. It was a bit hard to gauge the size, so I kept having my dad try on the glove as I worked each section to make sure they still felt ok. Turns out they have similar sized hands, so it worked out. Once I finished the gloves, Justin asked if I could add a button to secure the mitten top open with. I thought about doing it before hand, but I figured he wouldn't use that feature so I left it off. Whoops! It was really quick to add. The buttons are just 2 from my stash and I just made a single strand of yarn loop for them - since it's acrylic I don't have to worry about just one strand breaking with use. Hooray! I think the buttons are a nice finishing touch, so I'm glad he had me add them. I will say I liked these gloves enough to want to make some for myself, so perhaps you'll see this pattern up here again. Maybe not til next year, but it will happen sometime. Aren't free patterns the greatest? I'm so glad this one is out there, and I definitely recommend it if you like the style. Those are really nice gloves. I have thought about making some for myself because sometimes my hands are cold when I knit or crochet. I am glad you are working things out with your husband. I wish you success with that. Thanks, Deborah :) I have the same issues with my hands in the cold! Good idea.